More than half of Australian patients aged over 65 and prescribed statins aren't taking their medication as directed, a Monash University study has found. 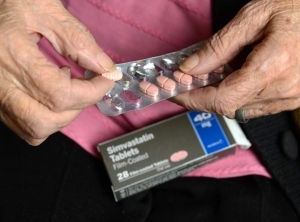 Most older Australians prescribed statins to lower their cholesterol don't completely follow doctor's orders when it comes to how long they should take them, with many giving them up within a year. A study by Monash University of more than 22,000 patients aged over 65 found more than half were inconsistent when it came to swallowing statins first prescribed to them between 2014 and 2015. Fifty five per cent failed to take their statins for at least 80 per cent of the time they were meant to in the first year of their doctor prescribing the medication. The study, published in British Journal of Clinical Pharmacology on Wednesday, also found two-in-five patients stopped taking their statins in that first year. Doctors recommend statins to people who have, or are at high risk of, cardiovascular disease as the drugs can lower a patient's risk of heart attack. But in recent years some patients have become wary amid reports about potential side effects, despite medical experts saying they tend to be mild and temporary, such as muscle pain. The Monash University study found that patients over 85 had the highest non-adherence rates, as well as those who had diabetes, anxiety, or were prescribed statins by their GP rather than a specialist. Patients with hypertension, angina, congestive heart failure, and those already using multiple medications were the most likely to stick to their statin prescription. The study's authors said while statins are widely prescribed to older adults, their effectiveness was undermined by poor adherence. They also noted that mortality rates generally are three times higher for patients who stop taking statins after having a heart attack than for those who stick to their medication. "The study findings highlight the need for interventions to improve statin use among older adults--in order that the benefits of statins can be realised--and recognition that certain sub-groups of people may require additional attention," the study's senior author Professor Danny Liew said. In 2013, more than 60,000 Australians cut back on or stopped taking statins after ABC TV's Catalyst program questioned their effectiveness. But a review of statins by The Lancet in 2016 found that the risks of a negative reaction from the medication were far outweighed by the benefits, prompting calls by the Heart Foundation for an end to the "fear mongering" surrounding the drugs.